We often receive emails asking about temporary motorcycle insurance for visitors to the U.S.A. and also for Americans who wish to travel to other countries. The visitors or tourists are usually renting a motorcycle but they sometimes bring their own bike on tour. Motorcycle Services wrote this article for us that describes some of the issues to consider when purchasing international motorcycle insurance or temporary motorcycle insurance for tourists. Motorcyclists who travel with their own bike in a foreign country are required to carry proof of insurance while riding. Your current insurance policy probably does not provide coverage for you or your motorcycle in a foreign country. Note also that Customs in the U.S.A. will not release a motorcycle without proof of insurance, and this is true also for most other countries. Also, a lien holder (i.e., the lending institution that owns your motorcycle until it’s paid off!) will not provide a release to ship a bike without proof of insurance for the country you will be traveling. Americans and Canadian citizens who plan on using a motorcycle for touring in Europe will need to purchase foreign motorcycle “Green Card” Insurance. This insurance provides coverage for American and Canadian citizens while riding in Europe. This insurance program meets foreign regulatory requirements for tourists. You need to purchase coverage for liability only or liability with fire, theft, vandalism and collision for the number of months you will be traveling. Also required are liability coverage; suggested is $750,000 per accident; bodily injury and property damage and medical payments coverage. You may also wish to consider optional coverage, including collision and comprehensive, guest passenger accessories coverage. Visitors to the U.S.A. or Canada will require temporary U.S./Canada motorcycle insurance. This insurance provides insurance coverage for visiting foreign nationals while riding as tourists in the United States and Canada. This insurance program meets the statutory requirements of each state in the U.S. and will comply with each Canadian Province. Coverage requirements include a choice of liability only or liability with fire, theft, vandalism; and collision overage for the number of months you will be traveling. Also required are liability coverage for $50,000-$500,000 per accident and bodily injury/property damage coverage, along with medical payments coverage. Optional coverage includes collision and comprehensive, guest passenger coverage and uninsured motorist coverage. If you know of a source for this type of insurance, please contact the Editor (below). 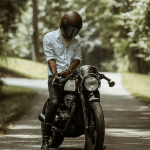 Temporary U.S./Canada Motorcycle Insurance: Fernet is an insurance broker that apparently can help visitors find motorcycle insurance for visits to the U.S.A. The following information came to us from Court Fisher, Global Touring staff at the BMW Owner’s News of the BMW Motorcycle Owners of America, who have a web page devoted to this subject entitled “Global Touring“. The site has information on “Touring in Europe”, “Touring Beyond Europe” and “Touring North America”, so visitors to and from the U.S.A. might want to visit the BMW MOA and search for more information. “The folks who wrote your piece, Motorcycle Services, Inc. are one good source of information and international bike insurance”, according to Court. Minimum mandatory European “Green Card” liability coverage is required for your North American (or other non-European)-registered bike taken to ride in Europe. It is not part of your US domestic policy and not available from your domestic US bike insurance company (with one known exception noted * below). Get it before you leave to clear bike through Euro Customs, and to ride legally in Europe. Euro “Green Card” and optional physical damage and theft coverage is available for bikes registered in any country from these brokers. Minimum mandatory third party liability-only Green Card insurance is administered by the ‘motor insurance bureaus’ of most European countries, through a Council of Bureaux. In addition to the brokers above, it is also sold at some Euro (but not UK) auto club offices, including notably any German ADAC office, at premiums much lower than charged by American brokers. But optional physical damage or theft insurance is not available or included as part of Green Card coverage sold by Euro auto club offices. Effective 2002, Green Card insurance is not available by application to ADAC in advance of arrival in Europe; you can obtain it directly from ADAC only by personal visit to any ADAC office with your vehicle registration & drivers license (payable by Visa/MC). Mototouring, Milan, Italy, info@mototouring.com; insurance valid in all Western European countries. *Active duty or reserve US military and dependents, and others who insure their US-registered bikes with USAA, www.usaa.com, can get Euro coverage–including comp–on bikes taken to Europe, at very favorable rates compared to US specialty brokers above; contact USAA’s Foreign Dept, 1-800-531-8189, for details. Note: This article is published as a public service only. webBikeWorld does not and can not vouch for the accuracy of this information; make sure you ask first and determine the motorcycle insurance coverage you will need for your trip. From “M.B.” (10/10): “(In this article) you reference USAA for coverage of military personnel. I’m a civilian expat living in Italy and a USAA member. In the research I have done with USAA, they only insure motorcycles in Germany and Italy. Liability motorcycle coverage is available to all members, but to qualify for comprehensive coverage of a motorcycle you must also insure a car with them in that country. From “M.O.” (5/10): “I want to rent a bike in California in October. That’s grand, no problem except that the (rental) company tells me that the only insurance they can provide to me does not cover the loss of the bike in the event of theft damage or total write off of the machine. Therefore I would have to pay for same from out of my own pocket. Yet they do provide insurance for small medical and any third party claim. I am not too comfortable with this situation as you can imagine. Would you or your readers know of any company that can provide full cover for the trip? I am 50 yrs of age with full licence and drive a heavy duty machine myself. So its not because I don’t have experience or a licence to cover same. I would be very grateful if you could provide me some info on this subject. Somebody out there must have been in the same situation as myself surely. Or do people just take a pure chance when they rent a bike in the States? I am an Irish citizen. Editor’s Note: We often receive emails like this from European riders who wish to visit the U.S. and rent a motorcycle. If anyone can provide guidance on this topic, please contact me at the email address above. Thanks!